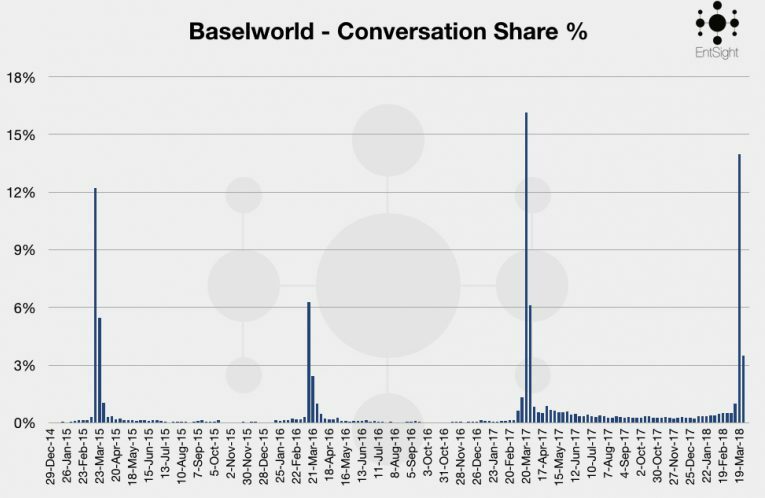 As the 101st edition of Baselworld comes to a close, here at EntSight we’ve been using our insight and research services to analyse the social conversation taking place prior to and during Baselworld 2018. Not only looking at which brands best captured the audience’s attention, but through conversation sentiment analysis we’ve been able to identify how attending brands such as Rolex, Omega and Tudor are being perceived online by the wider audience. 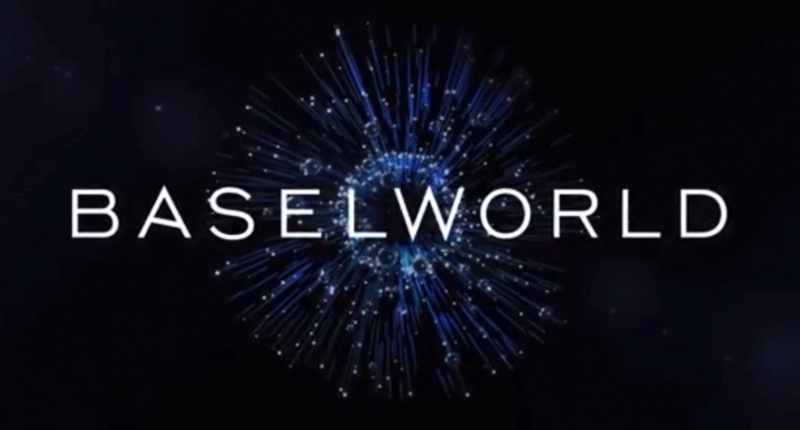 Looking at overall conversation share from the previous four Baselworld shows, it is clear to see this year’s show received less attention than what was seen during Baselworld 2017. However, Baselworld related conversation was more sustained between the two shows – something not seen previously. The peak in conversation share seen during Baselworld 2017 was largely due to the partnership between Bulgari and actor Kris Wu, with the hashtag #KrisWuBVLGARI being the most popular topic of conversation – even more so than #Baselworld2017. 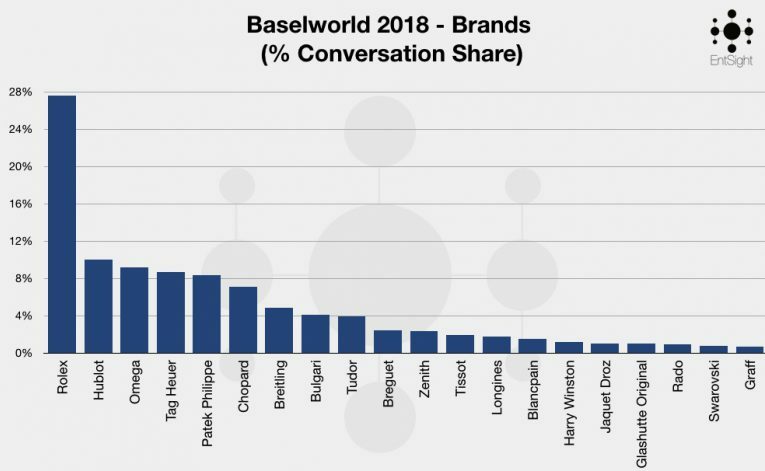 This year, it was the show itself which regained the top spot with #Baselworld2018 being the most discussed topic. Despite not receiving the volume of conversation seen in 2017 and 2018, the Baselworld 2015 show benefitted due to a partnership between Cristiano Ronaldo and Tag Heuer - with one tweet by Ronaldo announcing a special edition watch being shared 5,000 times on Twitter. 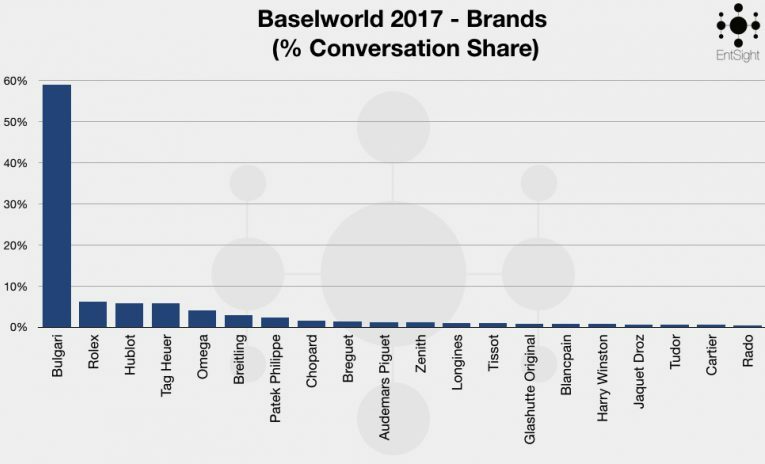 An impressive year for Rolex at Baselworld 2018 saw them become the most talked about brand attending the show; receiving a 27% share of all conversation. This was due to the much-anticipated release of the GMT-Master II Pepsi. In what will be welcomed news to Rolex, 10% of all Rolex related conversation in the lead up to and during Baselworld mentioned ‘Pepsi’. With a 93.5% decrease in conversation surrounding Bulgari compared to 2017, it was Hublot and Tag Heuer who were flying the flag for LVMH. For Hublot is was the combination of owned content on social media and launch of the limited-edition Spirit of Big Bang Sapphire that were the main drivers of conversation surrounding the brand. Head of LVMH Watches Division and CEO of TAG Heuer, Jean-Claude Biver, was the focus of much of the Tag Heuer related conversation during Baselworld 2018. An interview conducted with BBC News titled “Baselworld: Tag Heuer chief takes swipe at his industry,” was widely shared online. A product launch by Tag Heuer also generated a positive share of conversation for the brand. Tag Heuer's Japanese account on Twitter was the driver of much of the conversation surrounding the newly launched Carrera Calibre 16 Chronograph. For Omega it was their announcement of the Speedmaster Dark Side of The Moon Apollo 8 Edition that received the most attention for the brand. One of the biggest changes in conversation share between Baselworld 2017 and Baselworld 2018, related to Bulgari. Unlike last year, Bulgari didn't see the impact generated through the use of an ambassador. During Baselworld 2017, Bulgari saw over 50% of the overall conversation share, with 10% directly mentioning Kris Wu. Patek Philippe have seen a year on year increase in conversation share since Baselworld 2016, and have just seen their best year in terms of conversation share received. The driving force behind this increased level of attention during Baselworld 2018, was due the launch of the 5740G Perpetual Calendar Nautilus. This visually impressive watch resulted in a large number of photos being shared on social media. While receiving a high volume of conversation is beneficial to a brand, it is the audience’s reaction towards the brand that allows us to gauge how a brand is being perceived online. Identifying conversation sentiment also allows us to track any potential reputation risks in the form of negative sentiment. 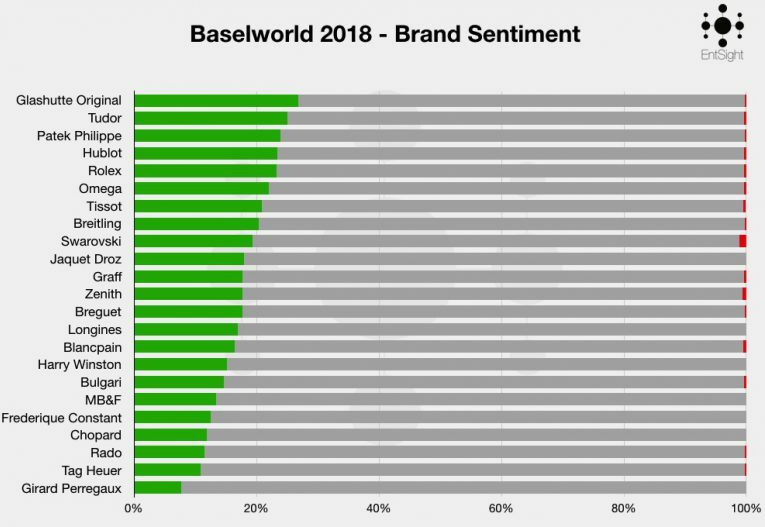 When looking at the positive and negative conversation sentiment relating to the brands present at Baselworld 2018, we often see smaller brands like Glashütte Original seeing the highest share of positive sentiment. Glashütte Original saw a 27% share of positive conversation, with the Sixties Panorama Date watch being the most positively talked about topic for brand. When looking at both the volume of conversation and the share of positive sentiment, Patek Philippe and Tudor were two standout brands. Patak Philippe were the fifth most talked about brands, whilst also seeing the third highest share of positive sentiment. With Tudor being the ninth most talk about brand and the second more positively talked about brand. Typically, a lower conversation share, like as seen by Glashütte Original and Tudor, is a contributing factor in their higher share of positive sentiment. However, during Baselworld 2018 we've seen Hublot, Rolex, Omega and Tissot all receiving above average shares of positive sentiment, in addition to high volumes of conversation. This is partly due to the strong online and social following which these brands posses. Essentially, volume of conversation share isn't everything here - a high share of positive sentiment still suggests the audience is responding well to their presence and communication throughout the show.